- Publisher The author shares key principles to having the kind of prayer life that will move your mountains and stir revival in home, church, and community. This book will show you how prayer produces power; teach you the key to prayer and fasting; prepare you to wait on the Lord; help you to pray longer, with more persistence; and instruct you on how to listen for God's voice. In Prayer That Brings Revival, best-selling author David Yonggi Cho shares key principles to having the kind of prayer life that will move your mountains and stir revival in home, church, and community. This book will: -Show you how prayer produces power. -Teach you the key to prayer and fasting. -Prepare you to wait on the Lord. -Help you to pray longer, with more persistence. -Instruct you on how to listen to God's voice. 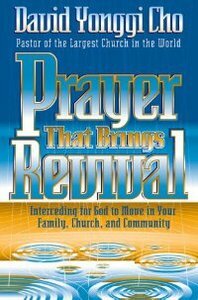 About "Prayer That Brings Revival"
The author shares key principles to having the kind of prayer life that will move your mountains and stir revival in home, church, and community. This book will show you how prayer produces power; teach you the key to prayer and fasting; prepare you to wait on the Lord; help you to pray longer, with more persistence; and instruct you on how to listen for God's voice. David Yonggi Cho is the founder and pastor of the church Complete Evangelic in Seul, south of Korea. The church is known worldwide as one of the bigger churches in the world. Pastor Cho is the author of numerous books inlcluding: The Fourth Dimension vol.1 y ll, Faith in God Moves Mountains, The Three Blessings in Christ, and Change Your Mentality. SPANISH BIO: David Yonggi Cho en un ministro cristiano de origen coreano, y pastor principal y fundador de la Iglesia del Pleno Evangelio Yoido (Asambleas de Dios), la congregacion mas grande del mundo con usa membrecia de 830.000 (cifras del 2007).